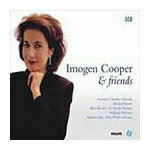 Imogen Cooper is widely regarded these days as one of Britain's (if not Europe's) leading pianists. Her repertoire covers all the great landmarks of the Classical era, from Mozart to Schubert and Beethoven, but she also adores the central Romantic composers - Brahms, Schumann, Rachmaninov and so on. She is also sought after as an accompanist and partner in chamber music. Her Australian tour in early June sees her playing with the Australian Chamber Orchestra, a band with which she has a great affinity. This three CD set offers a perfect profile of her considerable and versatile artistry.